As a lover of Italian food, an invitation to review the Vegetarian menu at Pizza Express was very much appreciated. As I have mentioned before, I detest going to restaurants where Vegetarians have a total of two or three dishes to choose from on the menu, so many menu choices which are suitable for Vegetarians makes a welcome change. Pizza Express have obviously put a lot of thought into their menu and considered people with all food tastes. They have also clearly considered Vegetarians, as there are so many Vegetarian dishes available on their menu, and others which offer a Vegetarian option. 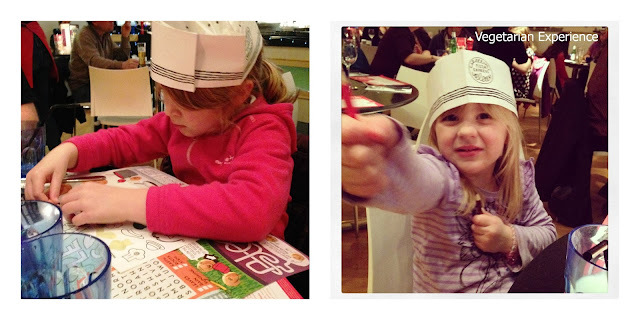 Pizza Express is a great place to dine as they appeal to people of all ages. 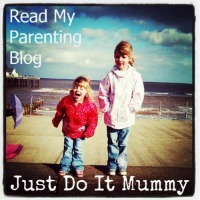 Pizza Express also cater really well for kids.We visited with the girls a couple of weeks ago. The girls were given a hat and colouring things when they sat down, which they were very excited about, and this kept them occupied throughout the meal. The restaurant was quite busy when we arrived, although we were shown to a table quick;y, the service was a little slow and it took a while for us to order and receive our drinks. 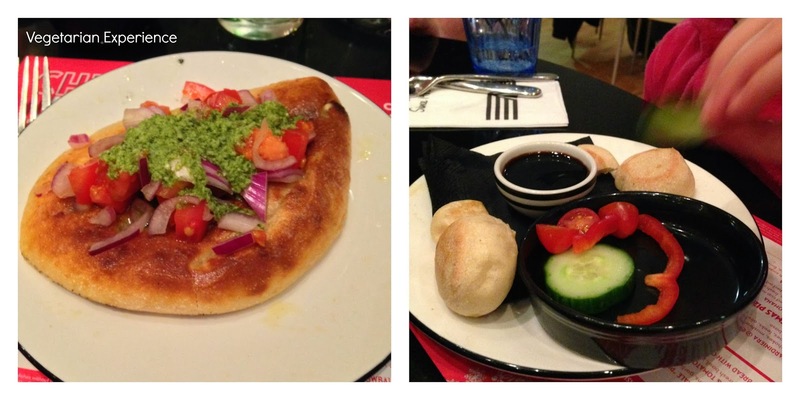 For a starter, we opted for Dough Balls and a delicious traditional Italian Bruschetta - tomatoes, red onion, and pesto. We all very much enjoyed our starters, they were a great opening to the meal, and they arrived quite quickly after we ordered. After starters, our mains arrived, although not altogether which is something which leaves me a little annoyed, as does having adult meals delivered before the kids. As someone with simple needs, eldest opted for the traditional Margarita pizza for a main course, whilst my little carnivorous youngest added some ham on her pizza. They both really enjoyed their pizzas. I went for the Caprina Rossa: Beetroot, goat’s cheese, red onion, garlic, tomato and mozzarella, finished with Gran Moravia cheese, rocket and pesto, served with a wedge of fresh lemon. Whilst my pizza looked and smelt lovely, I don't think it came as described on the menu as the pesto and the wedge of lemon was missing. Unfortunately, it was also stone cold. I sent it back, and it came back a few minutes later, redressed on the top, but with the dough underneath absolutely burnt to a crisp and black. I would accredit this to the restaurant being pretty busy, and to be honest, I would have expected a replacement pizza rather than serving me a burnt one. I also went for some Polenta Chips served with honey and mustard dressing which were very satisfying. After finishing our meals, it took at least twenty minutes for our mains to be cleared, which was quite unacceptable - I got the feeling that the waitress was ignoring me after I complained. By this time, youngest was starting to get a little antsy, and so I eventually had to go and ask for our mains to be cleared. As dessert is the kids favourite part of a meal, we rounded off the meal with something sweet. The girls went for a piccolo sundae. They also loved the fact that their dinner came with a babyccino - it made them feel very grown up! We chose the Chocolate Fudge Cake and the Banoffee Pie which were both really good. Our bill arrived and the waitress came and stood over us and asked for our "vouchers" whilst I was still eating my dessert - which I found a little rude as I don't like to be hurried along with my food. Despite my disappointing pizza, and the slow service, I would definitely visit Pizza Express again, as they do have a really great Vegetarian menu and they also offer brilliant family dining. Everyone else's food was hot and they were all happy with their menu choices. The kids loved their individual pizzas and the portions were reasonable. I would probably simply steer clear of the particular outlet we attended, and visit others nearby instead as the chain as a whole holds a welcome place in the UK restaurant market. Very disappointing about the slow service and your poor quality pizza. Pizza Express isn't exactly cheap and you would expect better of them. Like you, I don't like to go places with only 1 or 2 vegetarian meals. Don't places understand that vegetarians want a choice too?! So it's great that there's a big range of options. 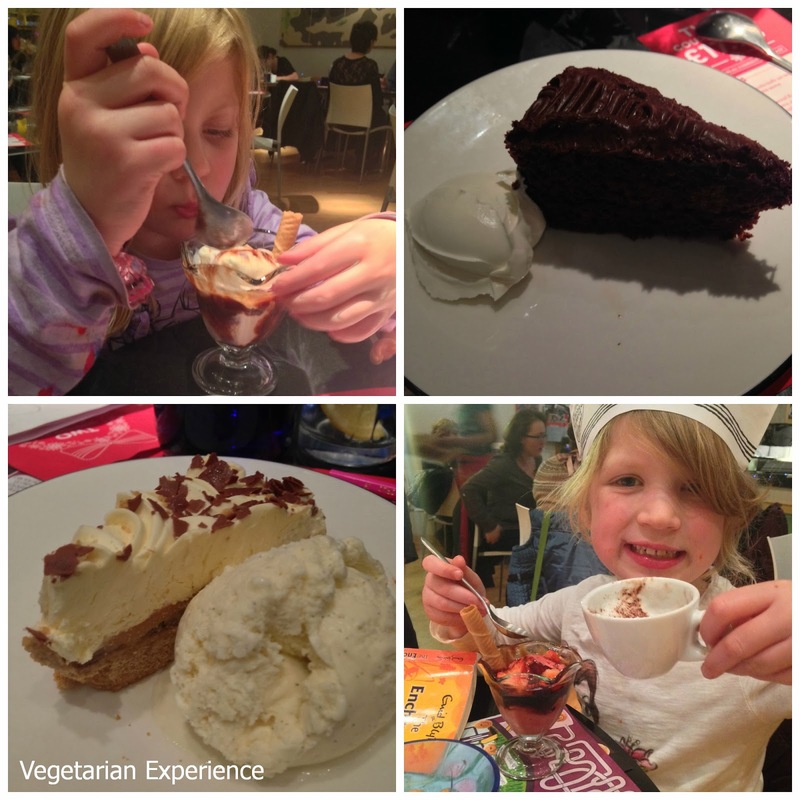 I love Pizza Express for the choice and the light pizzas work well for my diet - love the little desserts too. I do find that service can be a bit hit and miss generally though - I suspect that they are just a little bit less staffed than some other places, meaning that it can be quite slow.